The story gets more complex when Frodo and his faithful friend Sam get separated from the rest, thankfully as it turns out, because they can plough on to the fires while Sauron pursues the others. These include the myseterious Aragorn, the rightful heir to the throne of Gondor, the human kingdom best equipped to resist Sauron. He finally gets there and resumes the throne and rallies various groups which had begun to think resistance was useless. Meanwhile Saruman, who had made the fatal mistake of upsetting nature, is overcome, in The Two Towers, the second book in the trilogy, by the woods which wake from their long sleep and overcome him by storm. The adventures of Aragorn and his coalition in the final book, The Return of the King, are counterpointed by Frodo’s pilgrimage, in which he is accompanied not only by Sam, but by a strange creature called Gollum, who long ago had possession of the Ring but lost it by accident before it came into Bilbo’s possession. Gollum is determined to get the Ring back, and oscillates between obsequiousness to Frodo and treachery, while acting as his guide to the fires. Frodo is almost dead with exhaustion when he gets there, but with some unexpected help from Gollum he succeeds in his task, bringing sudden relief to Aragorn’s forces, which have fought valiantly but seem on the verge of collapse. Sauron implodes as the Ring is destroyed in the fires, and the world returns to normal. But both Frodo and Bilbo realize that the experience has scarred them conclusively, and they cannot continue in the shires. They go away with the elves to a different sort of existence, while the shires return to bucolic joys. The story itself is compelling, but it also has a range of connotations which provide additional interest. Most obviously, the Two Towers are held to represent the evil empires that threatened the West, namely Nazi Germany and the Soviet Union. The sudden shift in Saruman, originally a good wizard, paralleled the decision of the Soviets to reach an agreement with Hitler, which led to the partition of Poland in 1939. Such a parallel is easy to draw, though not really precise in terms of chronology or motivation. More interesting is Tolkien’s presentation of the corrosive attraction of power, even on the unassuming such as Bilbo and Frodo. Most striking is the description of Gollum, obsessed with his ‘Precious’, as he terms the Ring, even though he has no idea as to what he might do with any power he achieves, except to nurse and gloat over it. Sometimes we do not notice how this is a characteristic of so many people, though thankfully my attention was drawn to the phenomenon long ago, when a whole range of candidates would present themselves at elections in the Oxford Union. Perhaps unfairly, the girl who should have been President the term before Benazir Bhutto won, but who refused to stand (she gave in a nomination form, at the earnest request of many of us, but signed it Mickey Mouse) thought Benazir was of that ilk. Perhaps her first two periods as Prime Minister of Pakistan bore out that theory, though she seemed to have changed later, which doubtless contributed to her tragic assassination. Tolkien received a new lease of life a decade ago with Peter Jackson’s stunning film of the trilogy. He captured the essential simplicity of the members of the fellowship, the brooding landscapes through which they make their way, the impressive force of nature released after provocation, and the banality that accompanies evil, even at its most powerful. He chose his cast judiciously, relatively new faces along with established actors, while deploying technology effectively, especially for the awakened trees, and for the Orcs, the brutal warriors Sauron rouses from the earth. I can still hear the forceful grunt of one of them when winning an early battle, to the effect that the age of men was over, and the time of the Orcs had begun. Each of us can, I suspect, think of several parallels to that in real life. Jackson’s actors had a field day, in particular the veterans Ian McKellen and Christopher Lee, as Gandalf and Saruman respectively. Gandalf is captured by Saruman and held at the top of a tower with no recourse to magic, but one of his feathered friends comes to his rescue, and he gets away, after a preposterous duel that combined magic and cunning in a high camp parody of a similar duel in ‘The Raven’, between Boris Karloff and Vincent Price. They however, as befitted dignified wizards of an earlier age, remained seated at either end of a long table, and simply launched magical missiles at each other. McKellen and Lee, despite their advanced ages, had to be more energetic. 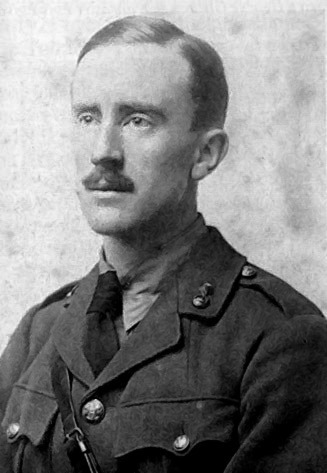 The film roused much interest in the books, though sadly it was more concerned with spectacle and mass rivalry rather than the subtle examination of the soul that was also part of Tolkien’s achievement. The anguish Frodo felt was rooted in the physical in the film, though I suppose that was understandable, since words are required to express the inner turmoil people under conflicting pressures feel. Tolkien’s achievement was to convey in his mystical tale the inner reaches of the soul, while also penning a rollicking good read.